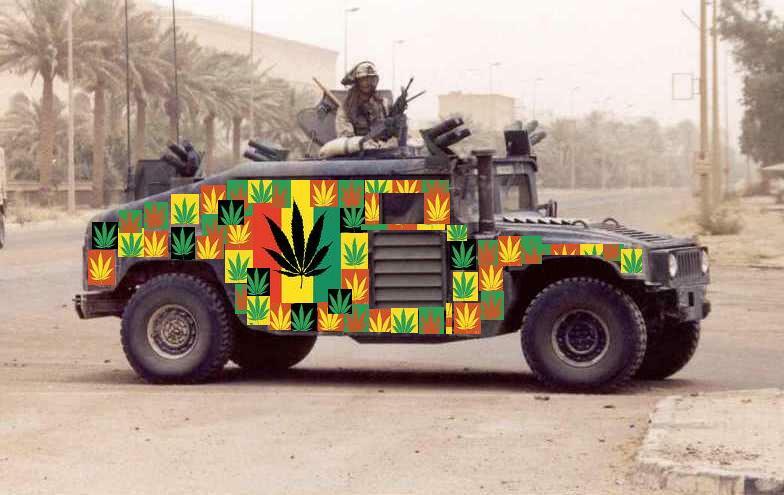 Can You Believe Armed Trucks Are Essential In The “War Against Marijuana”? Police departments are using a government program to get military surplus items, including armored vehicles, hoping to use them to end marijuana cultivation and distribution. Police forces all over the country are using a government program to request military grade armored trucks, and other special equipment normally reserved for the armed forces. The sole reason for requesting such power hardware? The war on drugs; more specifically, marijuana control. With protests taking place all over the country, from disputes over political candidates to the Black Lives Matter movement, armored vehicles have become a common appearance in many cities. Police have been requesting them from the government, along with other military surplus items, in record numbers. Many police departments are taking these outlandish measures intending to end marijuana distribution and growing in their town. Thanks to the Pentagon and the Department of Defense, through the 1033 program state and city level police forces can request military surplus equipment. These items include ammunition, cold weather clothing, sand bags, weapons, aircrafts and the increasingly frequent armored vehicle, among many other things. Since beginning the program in 1997, more than $5.1 billion in military equipment has been donated to American police forces. This would all be well and fine if police intended to reserve the use of these items for violent protests and rallies, or for officers’ safety when dealing with terrorist attacks or active shooter situations. However, through an investigation done by Mother Jones, the scary truth was uncovered. Of the obtained 465 requests for armored trucks, more than a quarter of them were intended to aid officers’ with drug enforcement. In the requests, the word “marijuana” tied the word “methamphetamine” for most frequent occurrence. With an increased awareness of the presence of military equipment, it is no wonder why so many Americans feel they are living in a police state. It’s easy to prove there are much larger issues at hand, like mass shootings or the heroine epidemic, that law enforcement should be focusing their attention and resources towards. Still, marijuana cultivation remains their top concern. Unfortunately, the war on weed has saturated the information pool with untrue facts and marijuana propaganda. Many are taught from childhood to instinctively believe marijuana is dangerous, and so is anyone associated with it. The fear mongering has gone on for such a long time; for many, fear has shrouded the wonderful benefits offered by ganja. Every day, more and more military equipment is distributed to law enforcement agencies all over the country. Under President Obama’s administration, the types of equipment allowed to be transferred to states has been reduced, but armored vehicles are still being doled out on a regular basis to aid in marijuana eradication. Have you ever seen an armored vehicle in your town? Let us know on social media on in the comments section below.